Migration from Mexico to the U.S. and return migration back to Mexico has created a sizeable cohort of students whose education takes place on both sides of the border. These students are especially well-suited to participate in the binational economy because of their cross-border cultural fluency, and supporting their educational success should be a major regional workforce development priority. However, the flow of young people back and forth across the border can derail the educational trajectories of individual students who are not able to adapt to the pressures caused by migration. Major research has been conducted as part of UC San Diego’s Mexico Migration Field Research Project (MMFRP). 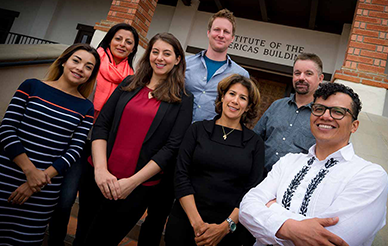 The Mexican Migration Field Research Program (MMFRP) is a unique, year-long program for undergraduate and graduate students who want an in-depth, community-based research practicum focused on international migration. 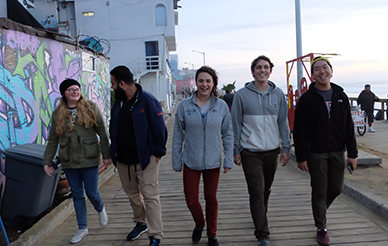 Students involved in MMFRP work directly with migrant families and often describe their participation as a life-changing experience. Participants may be able to use the MMFRP to satisfy international field experience requirements, obtain data for thesis projects and expand their publications records. This year, students will conduct interviews and surveys with deportees living in migrant shelters in Tijuana and with high school students with migration experience at schools in San Diego and Tijuana. The data gathered will shed light on how migration affects families and people’s lives on both sides of the border. All three quarters are mandatory, though exceptions will be made on a case-by-case basis. Spanish proficiency is highly recommended. The application process for is now closed for 2018-19. The deadline to apply each year is Sept. 1. For more information, please contact usmex@ucsd.edu. Findings from a 2015-16 survey of a representative sample of 7,000 9th and 10th graders at 65 schools in San Diego and Tijuana offered insight into the educational trajectories and professional aspirations of youth in the region. It helped to inform policy solutions for policymakers in California and Baja California to respond to the specific needs of the shared student population. This survey was undertaken in collaboration with the UCLA Civil Rights Project, the Colegio de la Frontera Norte (COLEF), UC San Diego’s Health Frontiers in Tijuana (HFIT) and the Faculty of Economics & International Relations (FEYRI) at the Universidad Autónoma de Baja California (UABC) in Tijuana. All organizations worked together with USMEX as equal partners on the teaching component of MMFRP, as well as the research design, survey development, data collection and outreach to school districts. 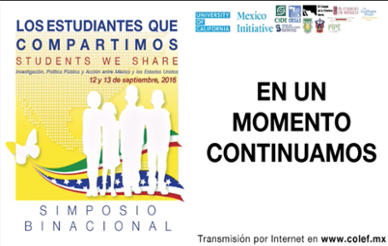 This work was made possible by the generous support of the UC Mexico Initiative and the Center for Comparative Immigration Studies (CCIS). Download the 2016 report in English (PDF) and Spanish (PDF). Download the 2017 executive summary (PDF) and policy brief (PDF).